This naxos album came out in 2014. 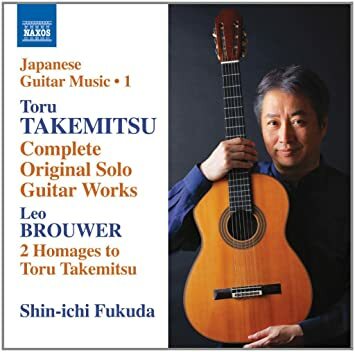 It contains all of the original solo works for guitar that Takemitsu wrote, as well as two homages for Takemitsu by the cuban guitarist/composer Leo Brouwer, performed by Japanese guitarist Shin-ichi Fukuda. I am trying to limit myself to new releases, but I want to get a thread started on Takemitsu and this is a really good album. The liner notes quote the New Grove Dictionary of Musicians that describes Takemitsu's music as follows: "modal melodies emerging from a chromatic background, the suspension of regular metre, and an acute sensitivity to register and timbre." This is a very apt description, but to me it leaves out what really makes Takemitsu interesting: the complexity of his musical phrases. These compositions have a very internal, stream-of-conscious character. They seem fragmentary on the surface, but on a deeper level are connected laterally the way thoughts are connected in the mind: casual and deliberate, whimsical and serious, dull and surprising all at the same time. To me, this music is an argument for the phrase as a foundational element of music preceding harmony and meter. Fukuda almost made this an "other instruments" post. I will definitely explore other recordings by him in the future. Fukuda is extremely good at controlling the expressive possibilities of the guitar with the right hand. There are notes in these compositions that mean nothing except for the way they are plucked. A note or chord can "hum" or "flare" or "snap," often suddenly. Fukuda is also very good at using negative space, which is critical in this music. These recordings sound completely natural, at ease, like rippling water on a still day. The Brouwer homages are also good. I have been a fan of Brouwer's music, although I never really immersed myself in it. It is interesting that both composers are modern, both use dissonance and traditonal tonality in a fragmentary and ironic way, but, unlike Brouwer, Takemitsu remains always unattainable, ungraspable. Alex Ross wrote a little notice about some performances of Takemitsu's works in NYC in 2007 in the New Yorker. The bulk of it, however, serves as an excellent overview of Takemitsu's life and work. This is a great starting point for people who don't know how to approach Takemitsu's vast catalogue, with several recommended works and recordings. If convincing performances of Takemitsu are hard to pull off in concert halls, they are easily found on recordings. The conductor Marin Alsop recently recorded an eloquent version of “A Flock Descends Into the Pentagonal Garden” for Naxos, and Tadaaki Otaka has led several fine collections of orchestral pieces for BIS. Perhaps the best of the bunch is Oliver Knussen’s DG disk “Quotation of Dream,” which brings together several masterpieces of Takemitsu’s final decade; in the title work, a fragment of Debussy’s “La Mer” surges to the surface of the music, making explicit the composer’s most profound and productive stylistic debt. Listening again, I realized that it is hard to say much about this music other than that it is uncommonly beautiful. Its processes remain mysterious, despite the best efforts of analysts and explicators. It almost shies away from the listener as it transpires, longing to return to the silence whence it came.